Looking for timeless Bambi quotes? Enjoy these memorable lines from a story about growing up and falling in love. If you need to freshen up on the plot, here is a quick reminder. 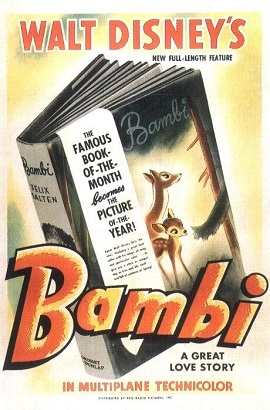 Disney’s 1942 classic features Bambi, an innocent white-tailed deer. The inquisitive deer grows up in a loving environment with his mother and his best friends, Thumper the rabbit and Flower the skunk. he great Prince of the Forest, rescues Bambi and takes him into his care. bi wins his fight with Ronno, he passes out from the struggle. When he wakes up, the beautiful forest is engulfed by a raging wildfire. While Bambi tries to follow his father to safety, he finds Fauline under attack by ravenous hunting dogs. He springs to action and fights them off, allowing Bambi and Fauline to meet with Bambi’s father outside the inferno. Safe, Bambi and Fauline begin a happy life together. Years later we watch their own family grow as Bambi takes his father’s role as Prince of the Forest. Enjoy these Bambi quotes that remind us about the power of love, friendship, and family. Thumper: Hiya, Bambi! Watch what I can do! Thumper: Come on, it's all right. Look. Thumper: "Eating greens is a special treat, It makes long ears and great big feet. But it sure is awful stuff to eat." I made that last part up myself. Faline: He's kinda bashful, isn't he mama? Bambi's mother: [last words] Faster! Faster, Bambi! Don't look back! Keep running! Keep running! Friend Owl: Nearly everybody gets twitterpated in the springtime. For example, you're walking along minding your own business, you're looking neither to the left, nor to the right, when all of the sudden, you run smack into a pretty face. WHOO-WHOO! [Flower jumps into Thumper's lap in shock] You begin to get weak in the knees, your head's in a whirl! And then you feel light as feather, and before you know it you're walking on air! [mimes walking on the air] And then you know what? You're knocked for a loop! And you completely lose your head! It can happen to you, and you! [looks at Skunk] Yes, it can even happen to you. Pheasant 1: [listening] Listen... he's coming! Pheasant 1: [Nervously] He's coming closer! Pheasant 3:: Don't get excited. Pheasant 1: [terrified] We'd better fly! Pheasant 3: No, don't fly! Whatever you do, don't fly! Pheasant 1: He's almost here... [hysterically] I CAN'T STAND IT ANY LONGER! Great Prince of the Forest: It is Man. He is here again. There are many this time. We must go deep into the forest. Hurry! Follow me! Bambi: Faline! Young Bambi: He stopped and looked at me. Bambi's Mother: Yes, I know. Young Bambi: Why was everyone still when he came in the meadow? Bambi's Mother: Everyone respects him. For of all the deer in the forest, not one has lived half so long. He is very brave and very wise. That's why he is known as the Great Prince of the Forest. Friend Owl: [everytime he is woken up] Oh, what now? Thumper: Whatcha gonna call 'im? Bambi's Mother: Well, I think I'll call him Bambi. Thumper: Bambi... Yep, I guess that'll do all right. Great Prince of the Forest: Your mother can't be with you anymore. Great Prince of the Forest: Come, my son. Thumper: [Bambi and Thumper see birds flying by. Bambi looks at them intriguingly.] Those are birds. Thumper: Look! He's trying to talk. Other rabbits: He's trying to say "bird." Other rabbits: Come on, say "bird." Say "bird!" Other rabbits: He talked, he talked! He talked, Mama! The Young Prince said "bird." Bambi: Bird, bird, bird, bird, bird bird! Thumper: No, that's not a bird. That's a butterfly. Thumper: No, that's a flower. Flower: Oh, that's all right. He can call me a flower if he wants to; I don't mind. Thumper: [starts to giggle] Oh, gosh. Bambi's Mother: Bambi. Quick! The thicket! Bambi's Mother: Faster! Faster, Bambi! Don't look back! Keep running! Keep running! Thumper: I'm thumpin'! That's why they call me Thumper!